Rome attraction-guides.com - Rome, Italy attractions guide Rome Castel Sant' Angelo (Holy Angel Castle) information about attractions, open hours, admission charges, history of papal fortress, secret underground passages and tunnels for popes, terraces, museum of weapons, location and address, tel / telephone number, general tourist information about Castel Sant' Angelo (Holy Angel Castle) in Rome (Roma) area, Italy (Italia) IT - Last updated 30/10/2012. Dating back to the 6th century, Rome's Castel Sant' Angelo (Holy Angel Castle) was converted into an impressive papal fortress and linked to the Vatican palaces by a number of secret underground passages, and these Castel Sant' Angelo tunnels have been used by several popes on a number of occasions when they felt under threat. The circular Castel Sant' Angelo in Rome was originally constructed as the mausoleum of Emperor Hadrian and now houses a fascinating museum, containing many historic artefacts from around Rome. 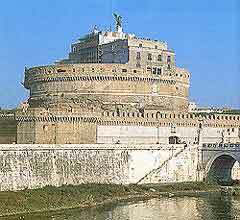 It is also at Rome's Castel Sant' Angelo that Puccini's Tosca plunged to her death. This wonderful circular building can be found between the Tiber and the Vatican and contains one of the most distinctive silhouettes of any building in the city of Rome. Attractions at Rome's Castel Sant' Angelo (Holy Angel Castle) include magnificent views from the terraces, historic artefacts and a museum of weapons. Castel Sant' Angelo (Holy Angel Castle) got its name in the 6th century, when Pope Gregory the Great saw an angel appear above the building, which her believed signified the end of the plague that was currently spreading across Rome.